Posted byBramus! January 20, 2018 January 22, 2018 1 Comment on CSS Paint API (Houdini’s Paint Worklet) available in Chrome 65! CSS Paint API allows you to programmatically generate an image whenever a CSS property expects an image. Properties like background-image or border-image are usually used with url() to load an image file or with CSS built-in functions like linear-gradient(). Instead of using those, you can now use paint(myPainter) to reference a paint worklet. Inside a paint worklet a CanvasRenderingContext2D has been made available for you to use. Use it like you would draw on a regular <canvas> element. Next to the CanvasRenderingContext2D you can also access the geometry of the element (e.g. 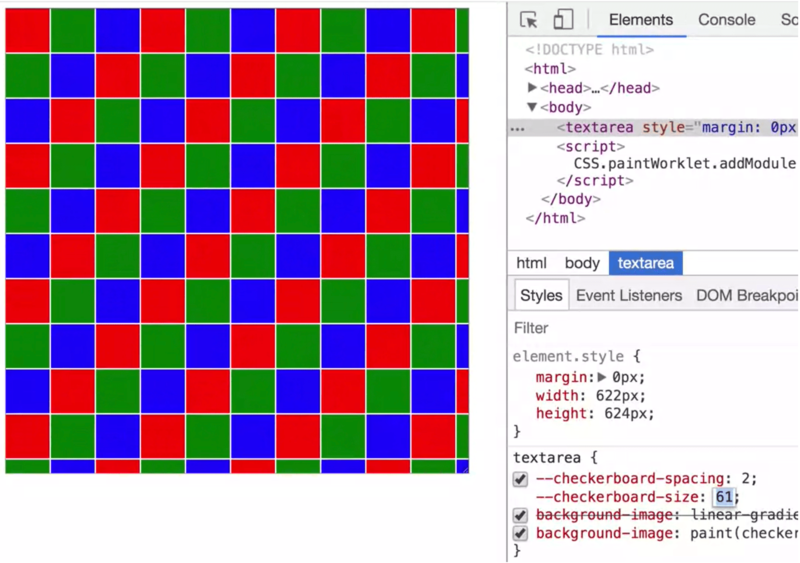 get width and height), and can access other CSS properties (including CSS Variables).